American Airlines 777W business class reviewed! 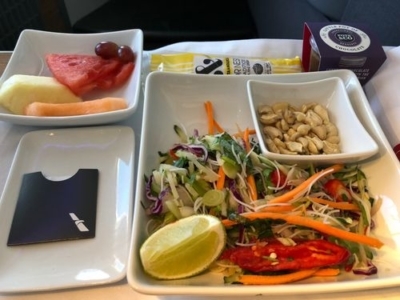 This is part two of my review of Business Class on American Airlines Boeing 77W (777-300ER) between London Heathrow and New York JFK. Part 1, which focused on the cabin, the seat and the IFE, can be found by clicking here. In this part I want to focus on the food on board. The thimble of champagne I received on boarding was not a great start, but things picked up rapidly when the meal service started. I was on the 2.30pm departure so this was basically late lunch / early dinner. Everyone got the same appetiser plate. What you have below is beetroot cured salmon and a ‘composed’ orzo salad. The beetroot cured salmon clearly makes a visual statement and is noticeably funkier than anything I would expect from BA. The bouillabaisse was good, and something I wouldn’t normally eat. Each dish seemed to have a bit of a twist (eg potato and pea mash) to make it a little different. It is worth noting that American also offers an express meal. You would receive your choice of main course plus a salad, fruit and cheese on a single tray, all served together. As this was a day flight and I had time to kill, I didn’t try it. American is famous for its ice cream sundaes. 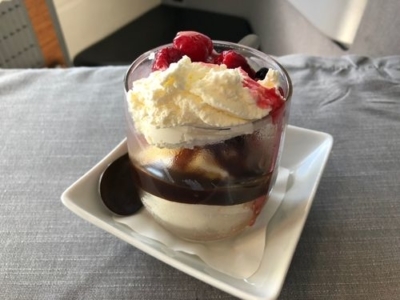 I was surprisingly impressed, I have to say – after a long Summer of trying to say ‘no’ to as much ice cream as I could, I enjoyed tucking into this. A second, lighter, meal is served nearer to arrival in New York. There was nothing hugely exciting about the salad but also nothing to complain about. The drinks menu was not very ambitious, but acceptable. There were five whiskeys / whiskys, including basic Canadian Club, Jack Daniel’s and Dewars, plus Woodford Reservve and 12-year old The Glenlivet. The beer list was a bit too heavy with Budweiser, Bud Light, Heineken and similar mass-market options, although there was a New Belgium Voodoo Ranger IPA. Bombay Sapphire was the only gin, Bacardi was the only rum etc. The wine list featured De Venoge Cordon Bleu Brut champagne. Alongside were two white wines (A to Z Wineworks chardonnay from Oregon, Ara Single Estate Sauvignon Blanc, NZ) and two reds (a merlot and a malbec). There was also a Quinta do Portal port which I really should have tried with my ice cream, but didn’t. Taken as a whole, I was impressed by the overall standard of food and drink in Business Class on the American Airlines Boeing 777-300ER. To be honest, because I fly as many First Class flights as I do Business Class, I occasionally begin to forget what you expect where. 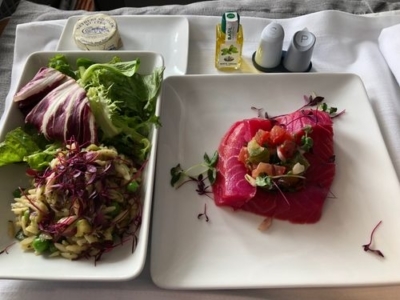 A caviar trolley – hello Lufthansa – is never going to appear to start a Business Class meal. Overall I found the complete American Airlines seat, service, food and drink to be impressive and I would happily fly it again. It’s not Qsuite or Etihad’s Business Class Studio but it is definitely a strong contender in the 2nd tier – and the Middle East carriers are not flying to North America from the UK anyway. If they spruced up the content on the IFE and improved the First Class lounge at Heathrow (which IS happening soon) I would be even more impressed. As far as booking goes …. using Avios, a direct American Airlines flight will cost the same number of Avios, and roughly the same taxes, as a British Airways flight. This assumes that you are flying on a ‘peak’ day – ‘off-peak’ dates are cheaper if you choose BA. You obviously cannot use a British Airways American Express 2-4-1 voucher however. It’s also worth noting that AA does not charge for seat selection in Business Class, although there are no duff seats here apart from the two window seats without a window towards the back. If you book using American Airlines miles – which are tricky to earn if you are UK based – there are NO surcharges added to AA redemptions, but they ARE added to British Airways redemptions. Using AA miles, redeeming on AA doesn’t just get you a better product – it also saves you a couple of hundred pounds in surcharges. I am very intrigued by the “express” meal. Who would ever want this? (you’re sitting there for 6-7 hours whatever menu choice you make 😀 ). 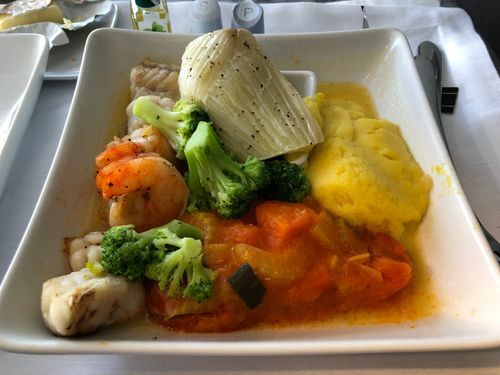 Has somebody found a way to get business passengers to choose economy food? In which case, that is genius! Someone who wants to work? Or sleep? I used to get the last flight back from NYC/BOS (which sometimes was well under six hours flying time) and get my head down before arriving and going to work the next morning. Hi everyone related to AA sort of…Does anyone know if I book dub ord jfk with the first leg on EI, second leg American Eagle – this all booked on the AA website, would this earn BA tier points? Thanks. I don’t think EI flights earn TPs in BAEC unless booked under a BA code (which AA can only force in by phone, not web). I could be wrong but definitely worth a second opinion unless Doug has material proof. I was pleasantly surprised by AA food, both quality and quality. Service was noticeably friendlier than on DL, but distant compared to VS and BA. I also liked their automated announcements when there was turbulence so all the crew quickly checked seat belts etc rather than one making an announcement. On my flight though the J class seat moved if the person behind me moved, they seemed to be linked. I’m a big fan of the AA business class product – definitely a lot better than Club World IMO.